Anyone that has ever played in the Minors dreams of getting the call to the Majors. Mitchell has received it twice. He just didn't got the chance to play. The Yankees called up the 23-year-old right-hander earlier this season but didn't use him before returning him to the Minors. In his two starts last week, Mitchell pitched like a guy who wants to be back. His start Sunday was his best in four outings with Scranton/Wilkes-Barre; his seven innings pitched and six strikeouts were both Triple-A highs. "It gives me confidence that they've called me up twice," he told MiLB.com Sunday. "They obviously think I can pitch there. Basically, I just need to keep proving myself here." Germano knows better than anyone else in the PCL how to finish what he starts. The Express right-hander tossed his league-leading third complete game of the season -- and second in three games -- Thursday at Oklahoma City. The 31-year-old hurler, who has made two relief appearances for the Rangers this season, has been one of the steadier arms in Round Rock, leading the team with 114 1/3 innings pitched over which he's posted a 4.25 ERA. Oddly, Germano has allowed more homers (19) than walks (18) this season. Duffey's transition to Double-A ball didn't go smoothly early on. The 23-year-old right-hander owned a 4.46 ERA and averaged only 6.4 K/9 through his first 13 starts in New Britain. Around the middle of the month, the numbers have done a 180. In his last three starts, he's allowed only three earned runs in 21 1/3 innings for a 1.27 ERA. What's more, he's done a better job of missing bats with 10.1 K/9 in that span, which looks even more impressive next to his 0.4 BB/9. His nine strikeouts last Monday were a career high. Unlike Duffey, Blair's strikeout numbers have been consistently high in his first full season. The 36th overall pick from the 2013 Draft has ranked at or near the top of the Minor League leaderboard in the category for most of the season with Class A South Bend and Class A Advanced Visalia, but it was going to be interesting to see how he handled Double-A foes during his first week in the Southern League. Consider the test passed. The D-backs' No. 4 prospect fanned nine and scattered four hits over 6 2/3 innings against Pensacola in his debut Monday and followed it up with only one run allowed on four hits and a walk with seven punchouts in seven innings five days later. Asher was singled out by Frisco manager Jason Wood as the RoughRiders pitcher to watch before the season, and the 22-year-old right-hander is certainly holding his own in the Texas League with a 3.63 ERA and 1.12 WHIP (third-best in the circuit). The Rangers' No. 13 prospect's pair of impressive performances last week were just what the doctor ordered after he had allowed four runs or more in each of his previous four outings. His seven strikeouts in seven innings Saturday, which also came without a free pass, were his highest total since June 11. Cotton was anything but soft against Bakersfield on Tuesday in what was easily his best start of the season. His seven innings matched a season high and his one hit allowed was his lowest total there in his 14 starts with the Quakes. The 22-year-old right-hander's strikeout (9.7 K/9) and walk (2.7 B/9) numbers have been impressive -- he also ranks third among Cal Leaguers with a 3.7 K/BB -- but he's been especially prone to the homer, allowing 16 in 85 innings while pitching in some of the most homer-friendly parks in the Minors. (He allowed three in Lancaster on June 11 and two more at High Desert on June 24.) Despite Cotton's 5.40 ERA, don't be surprised to see the Dodgers give him a shot at the more pitching-friendly environs of the Southern League, where he made eight relief appearances in 2013, before the season is out. The MLB Pipeline crew turned a few heads by putting Kukuk among the top-20 Red Sox prospects at the start of the 2014 season, especially after he averaged 6.8 BB/9 over 107 innings with Class A Greenville. The ranking came from a scouting perspective, given that the left-hander's control issues stemmed from his rawness rather than anything more troubling. But it looked like he slipped back into those same troubles in June, when he posted a 19.55 ERA with 19 walks in four starts (9 2/3 innings) for Salem. Well, the 21-year-old southpaw, who dropped out of the Sox rankings in MLB.com's latest prospect update, looks like he's found his form lately. After his stellar start Friday, Kukuk is 3-0 with a 1.17 ERA, 30 strikeouts and only nine walks in five starts (23 innings) this month. He owns a 5.52 ERA with 64 strikeouts and 46 walks over 58 2/3 innings with Salem this season. You'd be hard-pressed to find a more improbable pitching story in the Minors this season. Cole had enjoyed some nice numbers in the past, particularly a 0.81 ERA for Class A Short Season Vancouver back in 2012 but had never been able to really rack up the strikeouts. Now he leads the Minors in punchouts with 143 in 114 innings after fanning a career-high 12 on Monday and then nine more Saturday. Cole, who also owns a 2.92 ERA this season, credits an increased reliance on the fastball early in counts as the primary reason for the uptick in K's with his slider and changeup often sealing the deal late. "I've always said, to family and friends, you have to find something that's going to separate you," Cole told MiLB.com. "Two years ago in Vancouver, I had a [0.81 ERA] and that got me noticed a little bit. Last year was more of a learning year, and even though it wasn't a bad year, really, there was nothing to really separate me from the other guys then. Now, it's nice to have the strikeouts be that separator." The Twins signed Hu out of Taiwan back in August 2012, and all he's done is pitch well ever since. The 20-year-old right-hander started with Rookie-level Elizabethton, where he allowed three runs, struck out 16 and walked two in 16 innings, and was moved up earlier this month when Ethan Mildren's promotion opened a spot in the Kernels rotation. Following his two scoreless starts last week, Hu is 3-0 with a 1.50 ERA and 25 strikeouts in 24 Midwest League innings. "He's a command-control guy," Cedar Rapids manager Jake Mauer told MiLB.com. "He's able to spot up his fastball pretty good and used his change pretty well. He's a guy that can slow it down and speed it up, and now he's starting to learn how to make it move around and use it in the zone to get some outs, especially early in the count." Giolito's fantastic start, as great as it was, was marred by what could have been. The lone hit came on an infield single by Kannapolis leadoff hitter Adam Engel in the first inning on a bang-bang play that the Nationals top prospect though was called incorrectly. Perfect game or not, the start was the latest in a string of impressive outings by the 20-year-old right-hander, who is pitching in his first full season since 2012 Tommy John surgery. 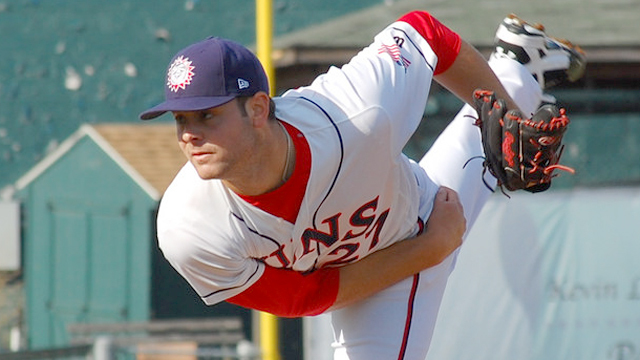 Giolito owns a 2.34 ERA, 1.00 WHIP and 88 strikeouts in 77 innings with Hagerstown this season. As such, he rose to the No. 11 spot in MLB.com's latest prospect rankings. "I'm definitely pleased with my development this year," he told MiLB.com. "I've ironed out a lot of things and added more tempo to my lineup. I've increased my command and control with the fastball and thrown my curveball and changeup for strikes better as the year's progressed. I'm very pleased so far." It's a gamble any time a Draft pick returns to school rather than signing. Wotherspoon chose to go back to the University of Pittsburgh for his senior year after being drafted in the 20th round by the Tigers in 2013. The right-hander went 5-6 with a 4.44 ERA with the Panthers and dropped to the 34th round and to the Yankees last month. Wotherspoon, who was a starter at Pitt but has been used exclusively out of the bullpen at Staten Island, is doing his best to make it look like the Yanks got a steal. One Hudson Valley hit and a hit-by-pitch Wednesday was all that stood between him and a pair of perfect three-inning gems. He owns a 2.29 ERA with 18 strikeouts, three walks and a .186 average-against in 19 2/3 innings in the New York-Penn League. A Rockies 29th-round pick this season, Sawyer began his professional career out of the Tri-City bullpen and allowed only one earned run over his first four appearances (6 1/3 innings). The Dust Devils gave him three starts, during which he gave up nine runs in 12 innings (6.75 ERA), and then returned him to relief, where he continues to thrive. The 6-foot-5 right-hander's best outing of the season came Sunday, when he allowed only one walk and no hits while fanning five in five innings against Everett. In six relief appearances, Sawyer owns a 0.59 ERA with 11 strikeouts and four walks in 15 1/3 innings. Pay no attention to the zero in Lubking's win column. He certainly pitched well enough to earn the "W" last Thursday, when he allowed only two hits and fanned seven over six sterling innings in Princeton's 5-4 loss to Johnson City. It was the longest of his six professional outings for the 21-year-old left-hander, who was selected by the Rays in the 14th round last month out of Pacific Lutheran University. He is 0-3 with a 3.08 ERA and 31-to-1 strikeout-to-walk ratio across 26 1/3 innings for Princeton. Moore spent last season in Helena after the Brewers took him in the 17th round of the 2013 Draft out of the University of Arkansas, and he struggled mightily, posting a 6.68 ERA and 1.61 WHIP in 13 appearances (32 1/3 innings). The results have been markedly better for the 22-year-old right-hander in his return to the Pioneer League. He was perfect across three frames Tuesday against Grand Junction and kept Missoula off the board for three innings Saturday. Moore is 1-0 with a 3.63 ERA, 1.43 WHIP, 18 strikeouts and four walks in 22 1/3 innings.